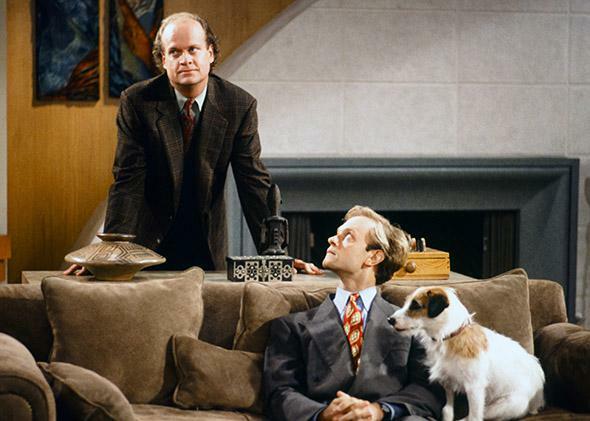 Why do people love the TV sitcom Frasier? Why Do People Love Frasier? Kelsey Grammer and David Hyde Pierce in an episode of Frasier. This question originally appeared on Quora, the best answer to any question. Ask a question, get a great answer. Learn from experts and get insider knowledge. You can follow Quora on Twitter, Facebook, and Google Plus. Frasier is one of my all-time favorite TV comedies. It aired in 1993 as a spinoff from Cheers (another good show), but it is completely different from Cheers—almost incomparable. Kelsey Grammer’s character Frasier is the longest-running (noncartoon) character in prime time. It doesn’t underestimate the audience’s intelligence. Niles: I assume they call him the hammer because he’s tough? Frasier: No Niles, because he loves the lyrics of Oscar Hammerstein. But most of all, it makes us laugh by pitting people against their own worst enemies: themselves. To see and appreciate that requires intelligence from the audience. It has a fascinating and deep premise. It’s about humans and how we deal with emotions, shortcomings, and insecurities: namely, ourselves. Frasier and Niles are forever trying to better themselves with talking, understanding, and processing. Martin and Roz represent the old-school “don’t feel, just live.” Neither side gets it right, and their personality confrontations form the core of the show. The show was slow in the beginning, but it took off once it settled on this premise and introduced deeper plot lines and characters: Frasier losing his job, Niles’ divorce, Martin’s finding companionship, and Frasier and Niles’ sibling rivalry and constant approval-seeking. The snobbery and aloofness are funny and well done, but they are mostly punchlines. The real core is characters confronting their own limitations. It is self-aware and self-reflective. I think Frasier’s producers were aware it was a very “white” show. There are a few black characters, but usually their race is part of the plot. The show self-reflects on this (though it could have done more). One of my favorite segments shows Frasier afraid to criticize his black co-worker. You can see how tone-deaf he is about racial issues. Later in the show they introduce Cam Winston, who has a minor role as Frasier’s social rival. It would have been great if he had a larger part, rather than say, Daphne’s mother. It has fantastic chemistry between the actors. It feels like they really are related. When Niles pretends to be Martin in one episode or when Martin does Daphne’s voice, it is priceless. Grammer was battling drug addiction in early parts of the show in 1996, and the cast intervened, which led to his stay in the Betty Ford Clinic. He’s mentioned in interviews how the cast helped him through this, and this really bonded them. David Hyde Pierce as Niles. Pierce literally created the role of Niles. There wasn’t going to be a brother, but his looks and acting made the casting directors change their minds. Pierce is an exquisite actor and creates a character who is witty, vulnerable, irritating, and sympathetic. The best plots involve the rivalry between the brothers. Grammer, Pierce and to some extent John Mahoney all play up their physical, slapstick comedy. I love the show. I find the best seasons to be three to six, the worst the first and the last two. Cheers (TV series): What are the narrative connections between Cheers and Frasier? Frasier: What are some of the best lines from Frasier? Sitcoms: What are some mind-blowing facts about the Friends TV series?